Manufacturing polymers is a messy business. When producing everything from plastics to pharmaceuticals, companies harvest petroleum, ship it to a factory, and then chemically process it, often generating massive amounts of pollution through emissions and hazardous chemical waste. Microscopic Escherichia coli bacteria, though often associated with contamination, may hold the key to a cleaner solution, according to students from the Harvard John A. Paulson School of Engineering and Applied Sciences (SEAS). Using synthetic biology, student members of the school’s International Genetically Engineered Machine (iGEM) team enhanced the process of biological synthesis with E. coli in an effort to make this environmentally friendly production method more affordable and accessible. 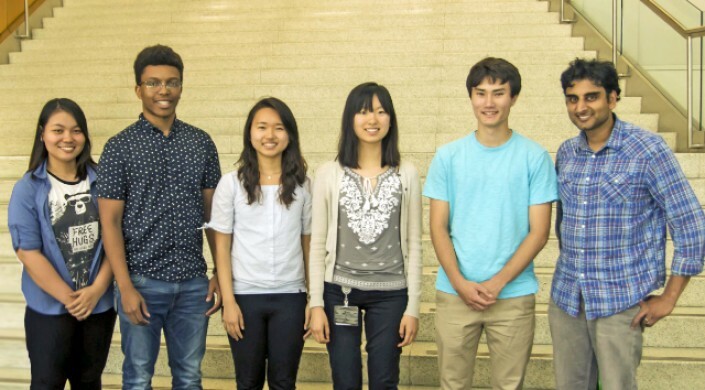 Their project, Opti-Poly, won a bronze medal at the recent iGEM competition, which included more than 300 teams from 40 countries. E. coli can be effective tools for polymer production, explained Reggie St. Louis, S.B. ’18, a bioengineering concentrator. The chemically resistant cells produce fibrous proteins called curli, which can be genetically encoded to take on any number of different properties. This unique ability enables curli to act as a biosynthetic platform for producing scalable and programmable materials. For their three-part project, the students first created a specialized plasmid, a circular strand of DNA, which can be used to boost a bacterium’s production of curli polymers, making the process more efficient. But E. coli will die if they produce too much curli before it can be harvested. To overcome this challenge, the students altered a sub-unit of curli DNA, called ribosome binding sites (RBS), and then used these modified RBS to specifically tune protein production, explained Erin Kim, A.B. ’19, a molecular and cellular biology concentrator. They devised a mathematical model that determines the ideal ratio of RBS to maximize curli production, while minimizing the accumulation of unwanted byproducts in the E. coli cells. Then, they integrated an optical density sensor onto a microfluidic chip, so they could monitor how well E. coli were producing curli without removing the bacteria from their environment and essentially pausing the production process. Finally, they developed a more cost-effective method to agitate the cell culture while infusing oxygen into the bacteria, a proven method to boost curli production. This simplified solution involved using a 3D printer to create a specialized chamber with a motor and an oxygen port. Accessibility is a hallmark of the iGEM competition. The students’ project has been submitted into the Registry of Standard Biological Parts, so researchers from around the world can access the data and potentially build upon the work they did this year. The proofs of concept, especially the curli production and export model they developed, make their project a valuable contribution to the body of synthetic biology research, said St. Louis. The team was mentored by Neel Joshi, Associate Professor of Chemical and Biological Engineering, postdoctoral fellow Anton Kan, and graduate student Miguel Sobral.